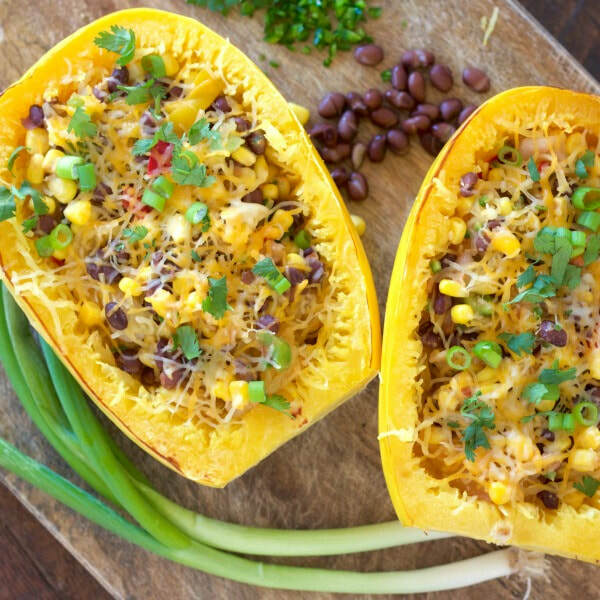 Our Spaghetti Squash Burrito Bowl is a filling, hearty, vegetarian dish. It's also fun to serve at any gathering! This recipe is similar to our Southwest Baked Potatoes and our Southwestern Pepper Cups. Cut stem off each spaghetti squash, then slice squash in half lengthwise. Scoop out seeds and dark orange stringy pulp with a spoon. Brush with olive or canola oil, and place cut side down on a baking sheet lined with foil. Bake for about 45 min, or until flesh is easy to pierce with a fork. Use a fork to scrape the inner fleshy part of each squash half, creating your "noodles". Spoon ¼ of the beans, corn, peppers/onions, salsa, and jalapeño into each squash half. Sprinkle cumin on each, then toss to combine. Top each half with shredded cheese, then stick (cut side up) back in the oven on the baking sheet for about 10 minutes, or until cheese is melted and mixture is heated throughout. Serve straight from the squash, topped with green onions, cilantro, or any other items you like! ​This information was funded by the USDA's Supplemental Nutrition Assistance Program - SNAP. SNAP helps low-income people buy nutritious food for a better diet. To get more information contact the CT Department of Social Services at 1 855 626-6632 or www.CT.gov/dss.